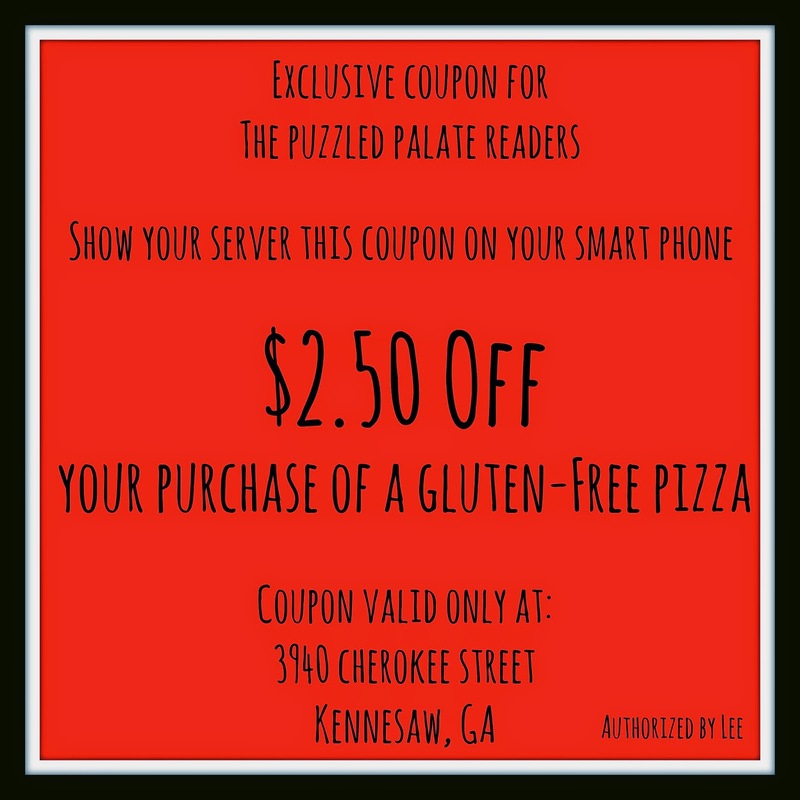 The Puzzled Palate: Johnny's Pizza Review with Exclusive Coupon! Johnny's Pizza Review with Exclusive Coupon! We received a gluten-free pizza to taste before writing this review. However, all opinions are my own. On our quest to find gluten free options for M, our family has reached out to our favorite restaurants. 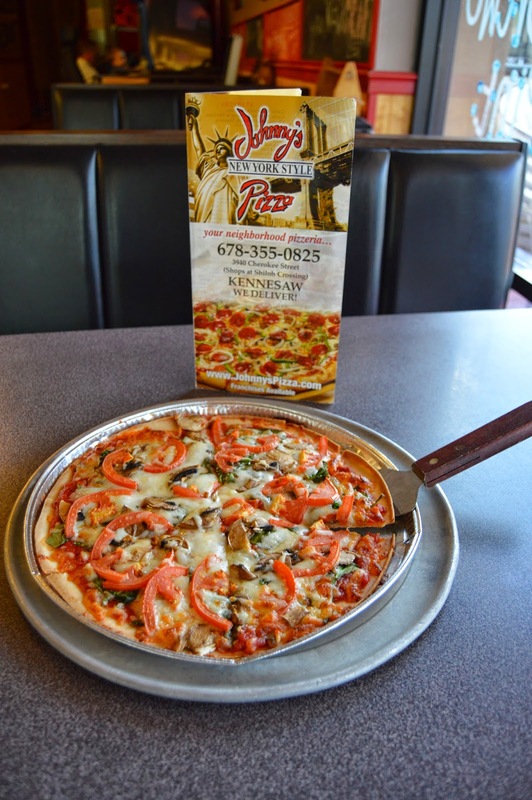 This week, we were invited to try a gluten free pizza at Johnny's Pizza in Kennesaw. 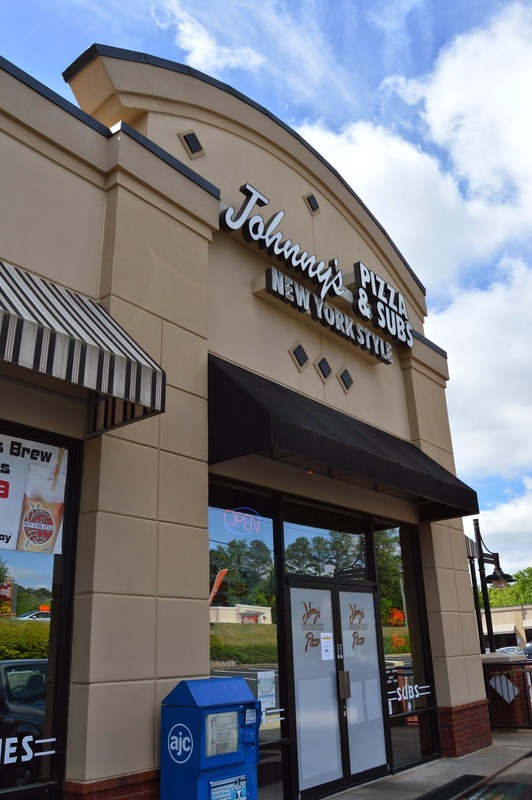 Since M was at school, Peanut and I packed the camera and headed over to Johnny's New York Style Pizza in Kennesaw. While our pizza was baking, Peanut drove a few laps in Johnny's arcade area. Johnny's 10'' gluten-free crust with our favorite toppings! After a 5 minute photo shoot with the pizza, I convinced Peanut to stop "driving" and participate in our taste test. There will be no pictures of me stuffing my face with pizza- but I can guarantee that I ate more than my fair share. Peanut was so excited to be the taste tester! I will take that as a positive review. The Johnny's gluten-free crust is a thin crust. It reminded me a lot of a flatbread. We enjoyed our mushroom, tomato and spinach pizza thoroughly. The manager and I agreed that GF crust does best with less toppings. Next time we go to Johnny's, we plan on trying a classic pepperoni. Once we pushed ourselves past the point of full, Peanut went back to his driving game and I spent some quality time reading over Johnny's menu. During my GF menu scavenger hunt, I came up with other gluten free options other than their GF pizza. All of their salads are gluten-free with the exception of the croutons on the caesar salad. *Be sure to check the ingredients in the salad dressings! They have another gluten-free dish called the Manhattan Garden that looks scrumptous! Click here to find a Johnny's New York Style Pizza near you! 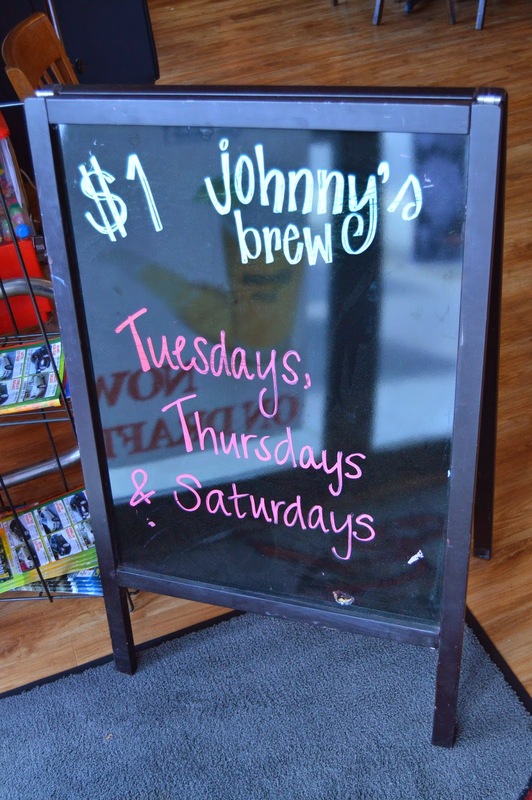 The manager at our neighborhood Johnny's wanted to offer our readers an EXCLUSIVE COUPON! This is the first coupon they have offered on the gluten-free crust. Please pack up the family and head over to the Cherokee Street location-tell them that The Puzzled Palate sent you! 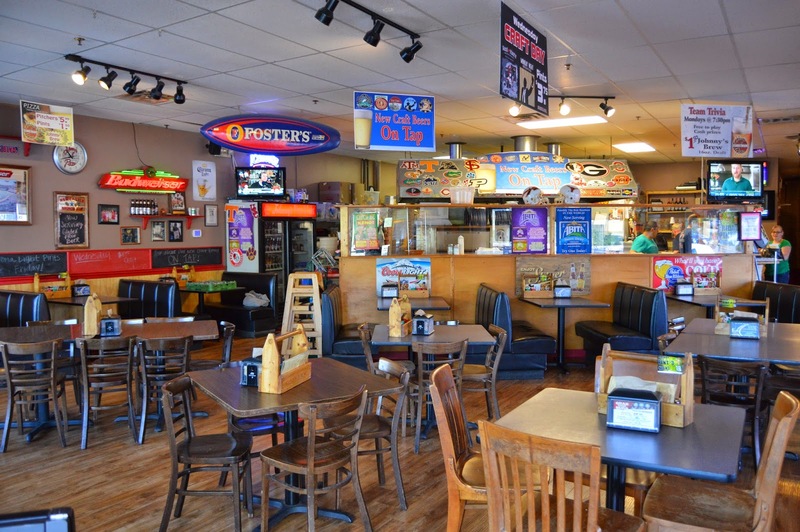 Click here to follow Johnny's on FB for specials and events like $ drafts & trivia nights! What are your family's favorite pizza toppings? Are you a deep dish, hand-tossed, thin or stuffed crust family? We don't have a Johnny's Pizza here in MA, but it makes me a little sad that we don't because the pizza looks awesome!! I love pizza! I don't think we have a Johnny's Pizza here in my area but I will keep an eye out. This looks like a very comfy place to take the family. We don't have one close but it looks AWESOME! Hubs wants! It's hard to find good pizza in the South. Looks like you found some. I have heard of this place from some of my mom fb friends.. We don't have one local but the picture of the restaurant smells like fresh pizza! Oh it looks good, esp that one w the tomatoes! That looks absolutely delicious - We don't have a Johnnys Pizza near us, but we will be traveling that way in just a month so I will keep an eye out! I love trying new restaurants, especially if they have PIZZA! What a fun place! That pizza looks delicious. Now I'm craving pizza! We don't have a Johnny's Pizza, but this place looks fantastic! I love hand-tossed crust and I'm a simple pepperoni girl. My husband tends to be a bit more exotic in his pizza toppings. That pizza looks delish. So yum!!! Gosh it has been years since I've been in Kennesaw! Now I have a reason to go. That pizza looks delicious! THat pizza looks beautiful! I'm so hungry. Is it dinner yet? That pizza looks great. Would love to go there! Oh man, that pizza looks so amazing! My daughter eats gluten free and would love it! Tomatoes on pizza, roasted in the oven, with it's soft center and crispy egdes are one of the foods of the gods. Aaaaaaand, I'm on a cleanse.... FEED ME SEYMOUR! I know so many people who are gluten free that I know my friends who love this. I would love to try it out as well. That pizza looks so good! It's so nice that more and more GF options are available! We love pizza! I'll have to come and see if it is NY style! I love pizza. Pretty much any pizza would be good for me. The gluten-free options are getting better and better as you just showed. Looks fabulous! I don't know of any places around here to get GF pizza, so I wish we had a Johnnys! That looks delish. I don't think we have a Johnny's Pizza here but it looks delicious. We love pizza so sounds good to me! My son is gluten-free and loves pizza. We'd give this a try if they were in NJ! That pizza looks delicious! we love pizza, and thin crust is terrific! I am not very familiar with gluten-free options and tastes, but this pizza looks yummy! My favorite is pizza with pineapple! I love Johnny's! I'm so glad they offer a gluten-free option! We don't have a Johnny's Pizza anywhere around, but boy I wish we did! That looks like a FUN place and yummy pizza! Yum! That pizza looks scrumptious. I don't have a gluten allergy, but I do enjoy gluten-free food for some reason. I don't think we have one of these restaurants near us, but I'll be on the lookout for one as we travel. I wish we had a John's here in NY, we LOVE pizza in our house. It looks delicious and love all the options they offer. I didn't know that Johnny's offered gluten-free options! My husband and I lived across the street from a Johnny's Pizza in Inman Park a few years back. It was decorated a lot different, offered adult trivia nights and fab drink specials, and definitely catered to the in-town crowd, but we LOVED it. I will definitely be on the lookout for another location closer to home! We like Johnny's. I didn't know that they were offering a gluten free option. It looks good! Oh my goodness that pizza looks so good. I wish we had one here. It looks like it was delicious fun! Thank you for the coupon. Looks like your little guy loved it! What a great coupon too, thanks! Oh the pizza looks yummy! And a coupon too- love coupons! Wish we had one of those here! My kids love flatbread styled pizza. Guess it makes for easier eating.